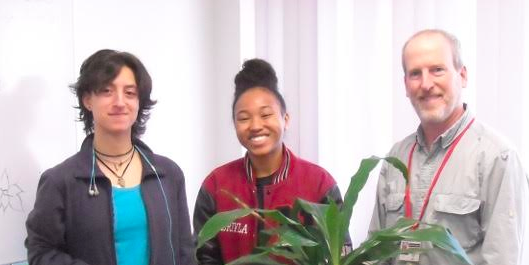 Pictured are students Ruth Uriarte and Jeriyla Kamau-Weng, plus Environmental Club Advisor Tom Perry. The mission of the club is to reduce the ecological footprint of Nyack High School through recycling, reducing waste and promoting more sustainable practices in everyday life. President George H. W. Bush made a call to public and community service a centerpiece of his presidency. At his inauguration in 1989, President Bush mentioned ‘all the individuals and community organizations spread like stars through the nation, doing good.’ In the first year of his presidency, President Bush founded the Points of Light Foundation to promote the spirit of volunteerism. The Just Food non-profit organization advocates for sustainable agriculture, which is the production of food using farming techniques that protect the environment. Sustainable farms produce crops and raise animals without relying on toxic chemical pesticides, synthetic fertilizers, genetically modified seeds or practices that degrade soil, water or other natural resources. During the spring, Keep Rockland Beautiful coordinates numerous community cleanups around Rockland County for the Great American Cleanup. The Friends of Acadia work together with the trail crew to reconstruct stone drainage and retaining walls, clear vistas and cut wood at campgrounds. The Student Conservation Association puts volunteers to work in parks, public land and urban green spaces to make improvements and learn conservation and sustainability practices. They’re taught how to plan, enact and lead, while making a tangible impact in conservation. “Student Jeriyla Kamau-Weng is taking Advanced Placement Environmental Science and is actively involved in the Authentic Science Research program,” Advisor Perry said. “Jeriyla participated in the Science Outdoor Alliance of Rockland (SOAR) project at the Nyack Center from October to December, teaching elementary students through firsthand activities.” Additionally, she also volunteers for the Hudson River Eel project that involves catching and counting eels in both Haverstraw and Piermont. SOAR works to strengthen children’s relationships with the natural world, including their understanding of the natural systems and the myriad of species that make up life on earth. This new project, through partnerships with the Nyack School District and Nyack Center, provides hands-on project-based learning programs to spark children’s innate curiosity and bring the natural sciences alive. In conclusion, students Ruth and Jeriyla both agreed that volunteering is a great way to get projects done and to educate the Nyack community. In addition, involvement in the environmental issues of Rockland County helps to prepare for college.